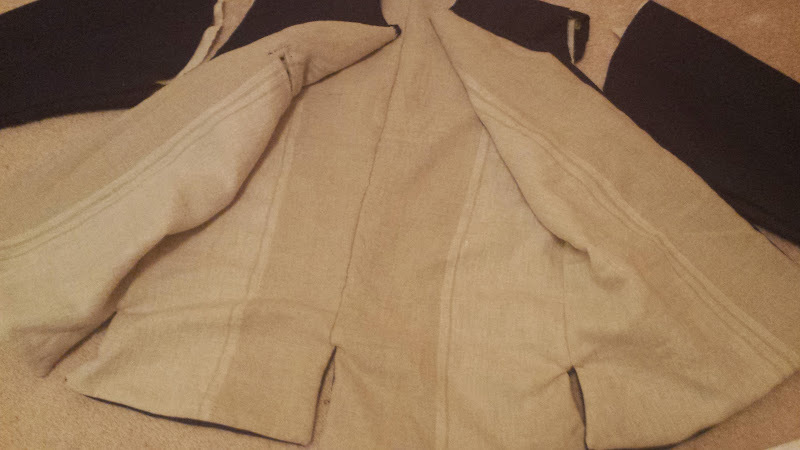 Started a sailor jacket. It is based on Reconstructing History pattern 704 - 1700s-1730s Sleeved and Sleeveless waistcoats. The medium weight wool is more a cross between royal blue and navy blue than it shows. The lining is a striped linen tablecloth from the local Goodwill store. oatmeal and light brown stripes. 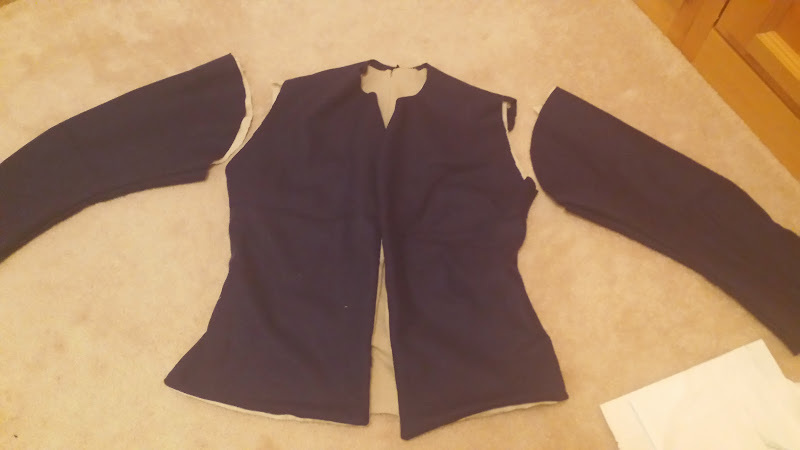 I decided I needed a blue sailor coat to portray a british sailor at some point in time. this color is very flexible for other things as well. No outside pockets, one inside the lining. thinking plain brass buttons at this point. Another nice addition to your kit. I can't wait to see it at events. Details on the fabric, if you please. What weight, bought from whom, etc. I've had the wool a couple years now, and dont remember where I got it. just remember I paid less than $10 a yard. I originally bought it for a lighter weight colonial regimental. The tablecloth (lining) was tagged 100% linen and is a looser weave than most, nice oatmeal with brown stripes. Interests:I enjoy going out to the local establishments with friends and family dressed as pirates. Looks great so far. Good luck with the sleeves, it is always my least favorite part as well. need brass buttons for this one and once size if determined, I'll do the buttonholes (yeah I know that is a large portion of the work). I am trying to get a brass button purchase arranged, so waiting til we know if that will go. When I have a price and info - I will post that. It's going to be a great finish. Awesome job! Can't wait to see some pics of you wearing it at an event (or better yet, in person in those circumstances).